This house has a great front porch. This is the classic California bungalow architecture. 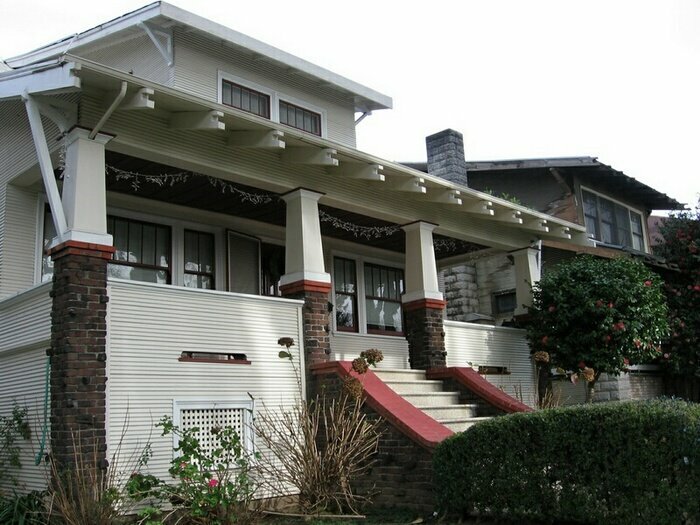 So why did houses from the early/mid 1900’s emphasize their porches? And why don’t we see this as much in new home design? Porches were the great social connector between the inhabitants and the outside world. Back in the day, people spent lots of time sitting on their porches. This was before television, so if you wanted to watch something, you went outside and looked around. Sitting on a porch with their iced tea or cold beer, the people had a great vantage point of the neighborhood. Others walking by had the chance to stop and visit, and share a cold drink. This was when people spent time talking with their neighbors about what was going on in their lives and what was important to them. I’m sure plenty of political arguments and neighborhood squabbles were settled on the painted floorboards of a porch. Now we are too busy to spend time sitting around talking in real time. Instead, we stay connected with email, text messaging and cellphones. We may or may not know our neighbors. We moved our porch to the rear of the house and called it a “deck”. It’s a different vantage point, I’m just not sure if it is to our advantage. I think the closest thing we have to porches now are blogs. It’s a whole lot less personal, but you get a larger neighborhood. Anyone, anywhere, can stop by and check in to see how you are doing. And blogs have their share of opinions, pointless ramblings and political arguments. It’s a little harder to share a good beer on a blog…but I’m buying. Next postQ) What’s gray and white and red all over?